This week is such a fascinating blog for us to write. 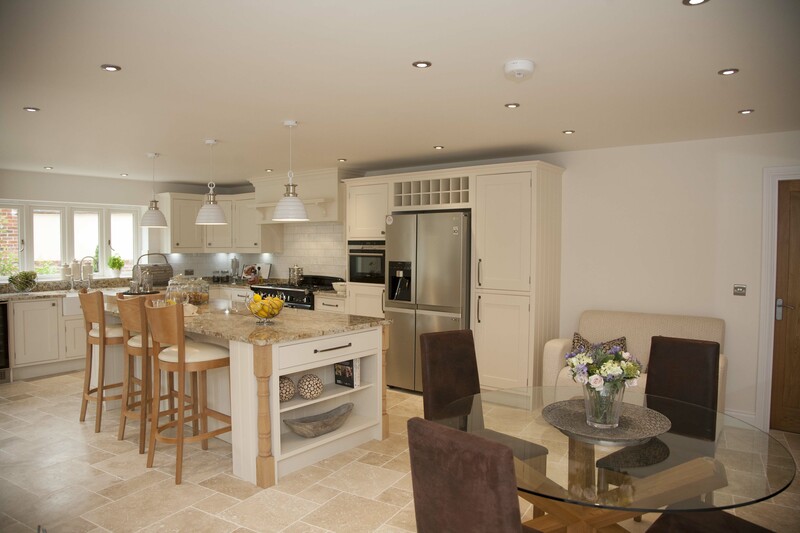 It’s about a kitchen that we designed and fitted recently in a new-build house in West Amesbury. The house itself is part-thatched, beautiful and was presented to the public, ready for sale, with everything you could need to move in instantly. It was lovely and the kitchen was one of the main features. This blog is a little sad because our dear kitchen will never live (at least in this home) – It will never be used to cook and prepare for family meals or dinner parties and never house the endless conversations that take place in the hub of the home. Unfortunately, the buyer of this new-build home has decided that the kitchen is not his style at all and he would prefer something more contemporary. We think he has every right to feel exactly this way – kitchen style is totally personal and what suits you may be my worst nightmare – we just feel it’s a shame that this lovely kitchen will need to be re-homed so soon. The builder of the house had no idea who would buy it, so he could not have done anything differently and it really highlights how very personal kitchen choices are and how impossible it is to guess what someone else may like! Even so, we wanted to share all the information and photos of this project before it disappears for good – and maybe live in hope that one of our readers may like to give this kitchen a home! Built from solid wood and painted in a lovely Farrow and Ball paint, this in-frame design is one of our own Lacewood Brand. 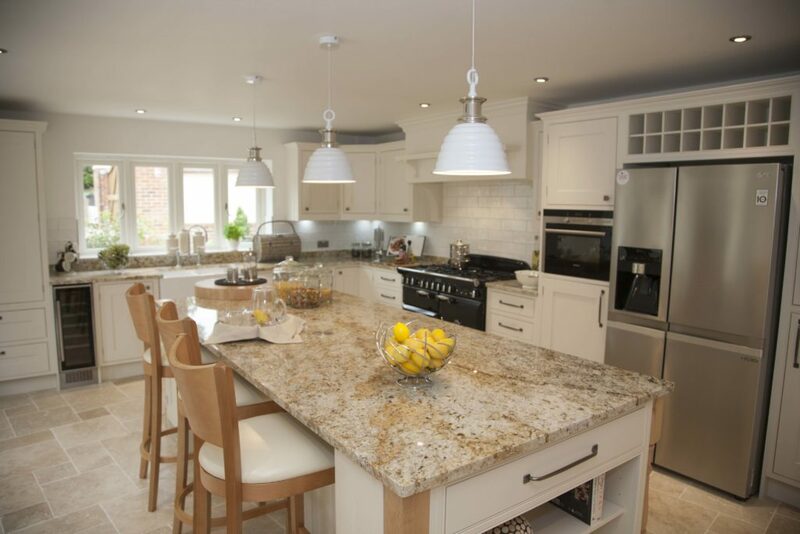 It was built exactly to our client, the house-builder’s, specifications. It features a fantastic island with a breakfast bar and seating. 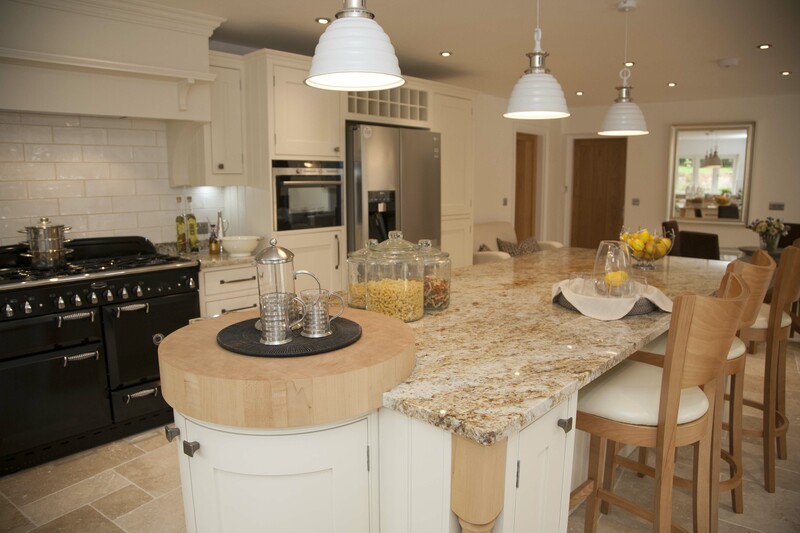 The island features storage cupboards, drawers, and an unusual curved unit with a wooden chopping board at one end. There is also a pull-up socket on the island and a very striking granite worktop in Colonial Gold. Our client was very keen to create something that stands out, so he actually visited the granite wholesaler to pick the most interesting piece of granite available. The ends panels in the kitchen are all made from tongue-and-groove boards and the doors are finished with a mixture of interesting knobs and long bar handles. There are quite a few appliances in this kitchen as it was kitted out to be as ‘complete’ as possible in this large new-build home. The main cooking feature is the Rangemaster Elan oven in black. There is also a built-in dishwasher and combi microwave (both Siemens), a built-in wine fridge (and a wooden wine rack to house those extra bottles!) and a concealed extractor in the canopy above the oven. The sink is a ceramic farmhouse sink with a Hornbeam Ivy tap – a lovely handmade British tap in solid stainless steel (our client really wanted this to be a quality kitchen and made his choices accordingly). 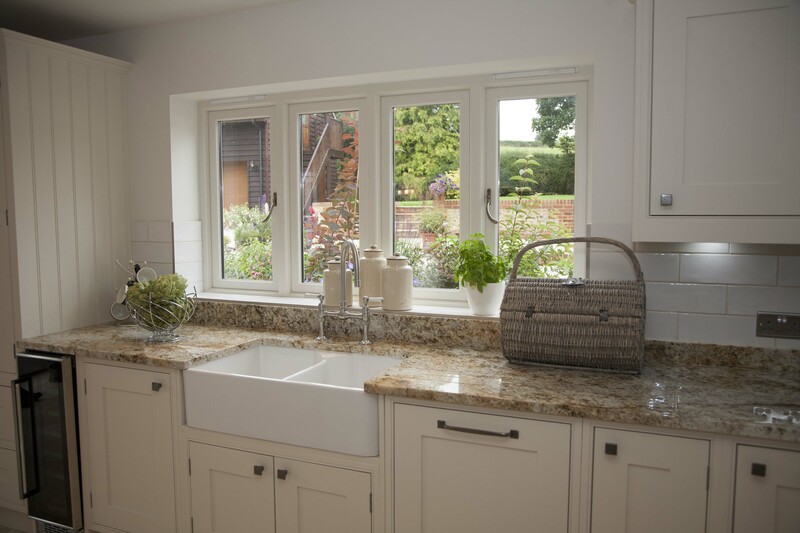 The sink is set perfectly beneath the window, providing a lovely view into the garden. One of my favourite features in this kitchen is the bookshelf/display unit at the dining room end of the island. This is an excellent space to store books or decorative items and provides a really useful link between the kitchen and dining room, seamlessly creating a flow between rooms. Another favourite feature of this kitchen is the large built-in larder with solid oak shelving on the left hand side of the window. 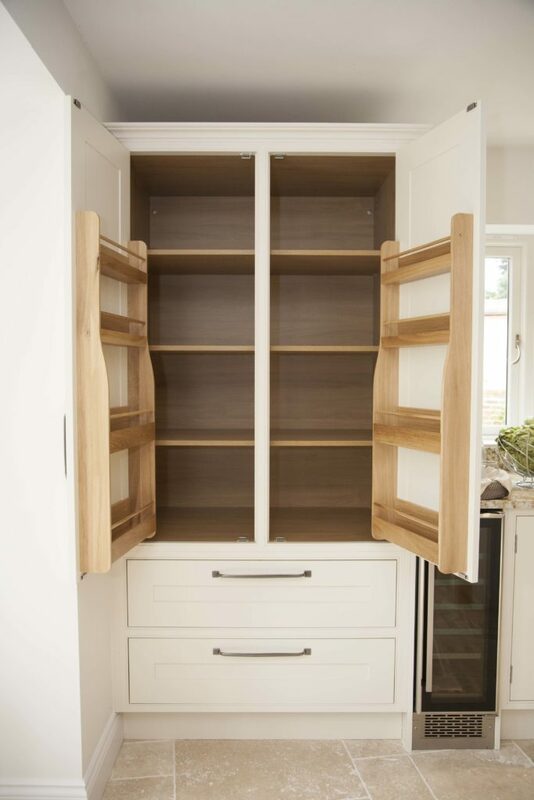 If there was not already enough space, this provides a fantastic amount of storage room and features wooden spice racks, shelving and drawers below. Now, most of our blogs feature kitchens that we have created that are in someone else’s home for good. 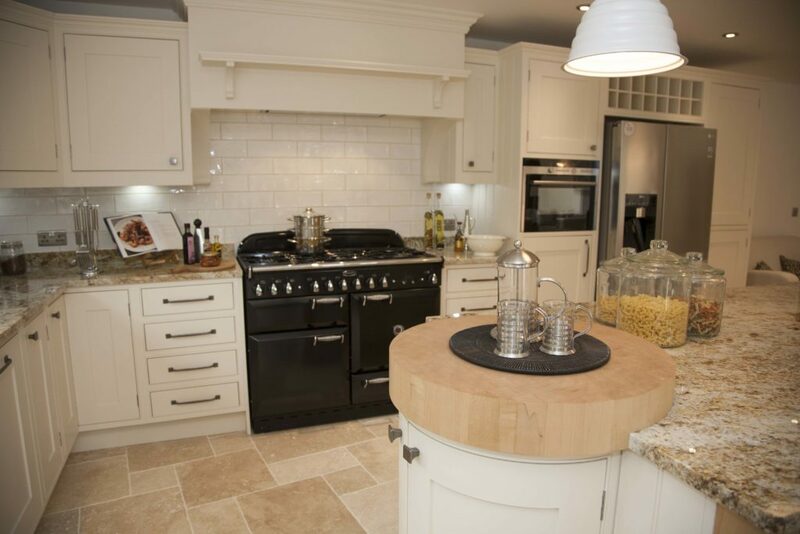 In this case, we are pleased to be able to offer this beautiful kitchen up for re-sale, should any of our readers be interested. I must stress that it is absolutely brand new, has never been used and only looks like part of a functioning home because the property was ‘dressed’ by professionals for marketing purposes.